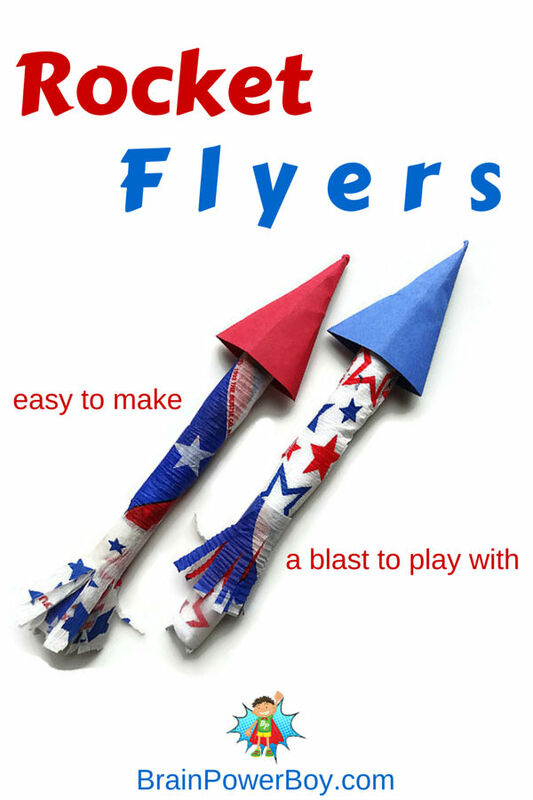 Make this awesome Rocket Flyer project for the 4th of July or anytime. It is easy to make and super fun to play with. I was trying to come up with an interesting and enjoyable project for us to do for the 4th of July this year. We like to shoot things off so I set out to make a rocket-type project that we could have some fun with. We specialize in activities for boys, and this one is great. My son liked it a lot and I know we will be using it in the coming months. 1. Center pen on white 8 1/2 long X 3 inch wide strip of paper. Tape paper to pen and roll the pen in the paper taping shut when finished. 2. 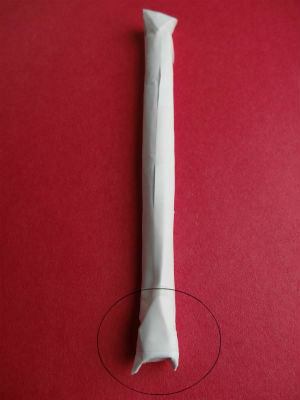 Fold the top of the paper into two peaks like you are wrapping a package and tape it down. 3. At the bottom of the pen barrel do the same but leave about 1/2 inch loose before taping it down. Smush (technical term there) the paper so it looks like the picture with an indent. This is what you are going to use to put against the rubber band as it makes it much easier for kids to shoot the rocket. 4. Make a cone out of colored paper for the top of the rocket. Tape it shut leaving no holes. Stuff pieces of crepe paper or paper towel into the top of the cone. Pack it so the top of the cone is hard. This is so the rocket top doesn’t get crushed upon landing. 5. Cover the paper on the pen with crepe paper or washi tape. Leave the bottom clear (about 1/4 inch or so is fine). 6. Squeeze some E6000 into the top of the rocket cone. You don’t need a lot but make sure you put enough in to hold the cone onto the pen. I put some in and swirled the pen around in there to make sure it was covered and then squeezed the cone around the pen a bit to make sure it stuck. 1. Take a big rubber band and put it around a chair with slats. 2. Pull both pieces of rubber band back, hold the smushed end of the rocket onto the rubber bands, and let fly. They go pretty far and are fun to play with. There are a lot of ways to shoot them. Experiment and see what works best for you. Have 2 people hold the rubber band and pull your rocket flyer back and shoot it. Take them outside and use bigger rubber bands. Use them to try to hit targets. Set up some empty plastic bottles and try to knock them down. 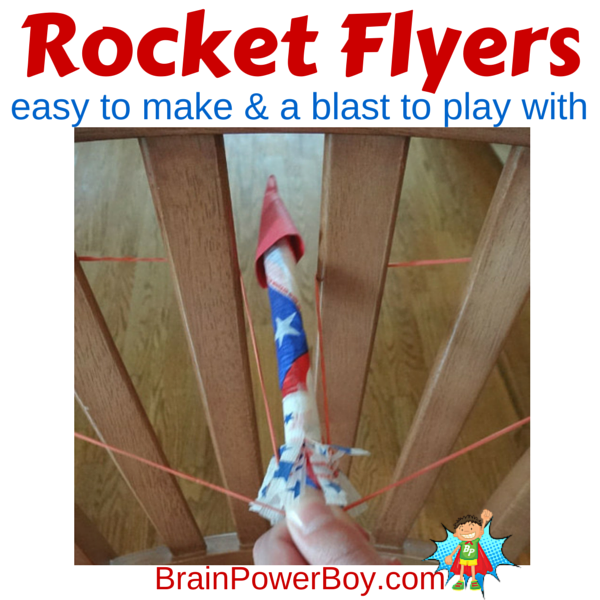 Believe me, we had a blast with these easy to make Rocket Flyers and we hope your kids will too. Let the kids go wild with these brightly colored crafts and activities for your toddlers and older kids to enjoy together. These free holiday planner printables will make planning a BBQ for family and friends a breeze! Happy Canada Day and Happy Independence Day my friends! Get outside with your kids this 4th of July with these wonderful Montessori outdoor ideas! Oh my – they look like so much FUN! Off to see if I can round up the materials because I really want to make these! So happy to hear you are going to make them Clare – and they Are fun! Oh how fun – my boys will LOVE these! Yay – hope they enjoy them. How cute! My boys would love this! Thanks for linking up with Good Tips Tuesday–we’re featuring this in the next linkup. I love this! I need to go through your site for more crafts like this. My boys have been on a paper airplane making kit; this fits in perfectly. Thanks for sharing your craft at Motivation Monday! Thank you for stopping by Barb. We have a lot of ideas on the Activities for Boys page including perler beads and LEGO designs. This looks like so much fun! Thanks for posting. Hello from Good Tips Tuesday. These look like a ton of fun to make and play with! What a great idea! Thanks Jennifer. I appreciate the comment. They are a lot of fun for sure. Sheila, this is brilliant! We have a purchased space shuttle that works something like this, and my son and my daughters all enjoy it (and fight over it). I never thought about making our own! Thank you for the feature – so exciting! I am super happy you like the craft. Hope you all have fun with it. Thanks Carrie! So glad you liked it. Thank you for the feature Wendy. I’m so happy you like them so much. You came up with an interesting way to use them!